How the Hernandez family will benefit from two well-stocked national digital library systems and a digital library endowment is the title of a LibraryCity essay. 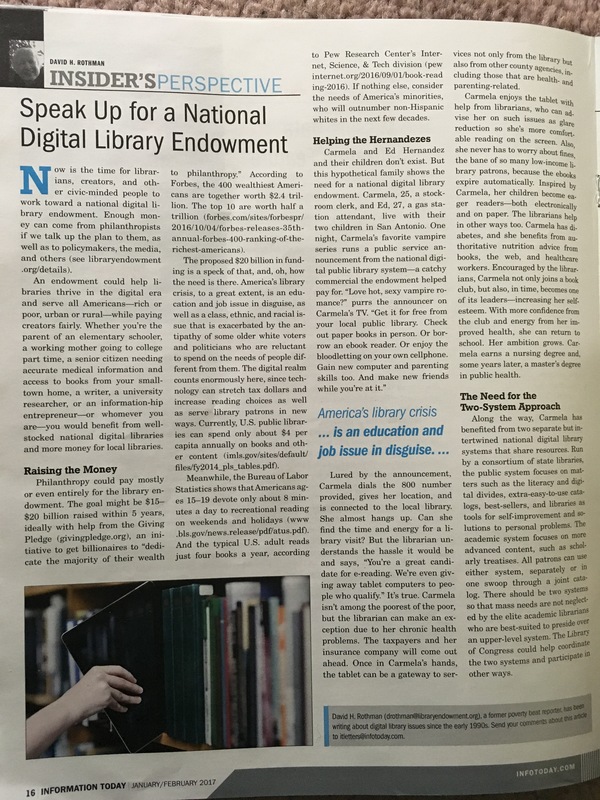 It appears in shortened form in the January-February issue of Information Today and also as an updated version on LibraryEndowment.org. The Hernandez scenario tells in detail how endowment-supported activities could help a fictitious family in San Antonio, Texas. For both kinds of libraries, the foremost feature and benefit will be the endowment approach itself. 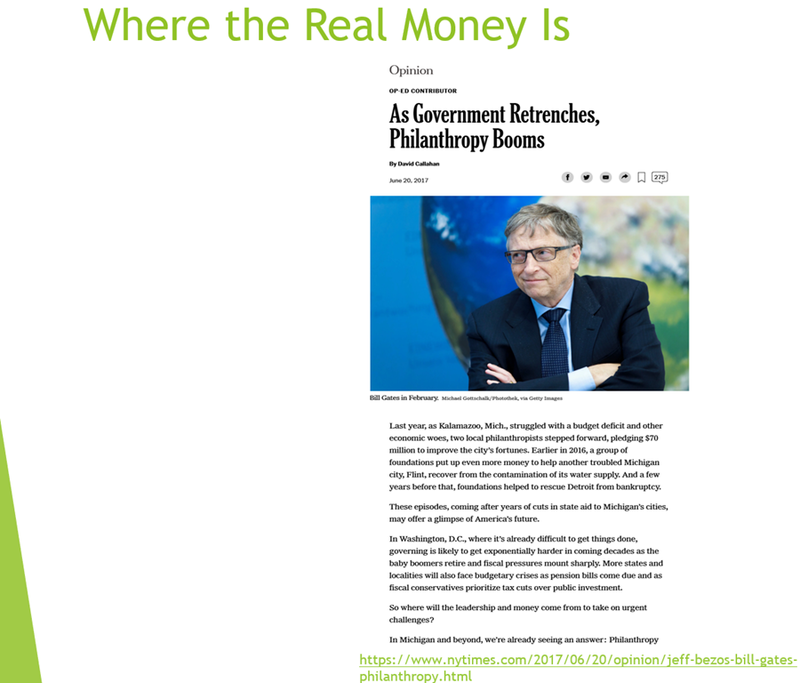 All too often, foundations regard libraries simply as places for experimentation rather than as beneficiaries of long-term funding to help insulate them from political whims. While libraries, culture, and knowledge are valuable in themselves, there are also solid business reasons for permanent ongoing funding of national collections and plenty else. Libraries need to be regarded as public services for us and our descendants, not mere experiments. They offer a significant return on investment. Many of the most successful investors in the stock market tend to think long term. And the same business people, in their philanthropic roles, should not shorten their time horizons for libraries. In fact, they should look beyond their lifetimes and think not just of names on buildings but also of content and of ways to disseminate, find and enjoy it, with or without brick and mortar. Names can go on virtual collections, not just physical ones. The priorities of public and academic libraries overlap but are far from exactly the same, the reason the U.S. needs two separate but intertwined national digital library systems. Public libraries cater to popular tastes and offer self-improvement opportunities and coping tools for the masses, such health or financial information available through books, multimedia, or reference desks. Taxes support them. Without recreational reading for average citizens, public libraries will die. Academic libraries, however, serve a different demographic group. They strive to play up the factual, insightful, important, and beautiful, not necessarily the most popular even though it can be. Basic coping tools, moreover, are not as important a component of the services of academic libraries, or at least are not the same kind. The public library system will include K-12 libraries, discussed in detail here. It will also include special libraries and museums interested in participating. Otherwise they can join the academic system. In fact, they can simultaneously be part of both systems. Same for community colleges. –Use of matching grants to help preserve local control of local libraries. National funding must not diminish local initiative. At the same time, the endowment should accommodate poorer districts without the opportunity to raise much money locally. –Governance of the public system by people focused foremost on public library and K-12 issues. The Harvard-originated Digital Public Library of American does not have one current K-12 educator or current school librarian on its ten-member board even though four-fifths of libraries in the U.S. are school libraries. Why not at least a president of a school library association? Furthermore, of the 11 members of the DPLA education committee, just one is school librarian. Organizations representing school libraries, rural libraries, and others close to the grassroots should play a key role in the creation of the public system. Significantly, the Chief Officers of State Library Agencies (COSLA) passed a resolution against the inclusion of the word “Public” in the DPLA’s name. Public libraries will want control of a national digital public library system. The intent here is not to harm the DPLA. On the contrary—its funding level would multiply in its new incarnation as the National Academic Library of America (NALA), funded by the endowment. The public side might be known as the National Public Library of the United States (NPLUS). Or perhaps just the National Library of the United States (NLUS) to limit the word “Public” to local libraries. –Economic and social benefits mentioned on this site’s needs and benefits pages, including a reduction in the “savage” inequalities of the library world. On the average, U.S. public libraries spend only around $4 per capita per year on books and other collection items. The $4 falls short of actual needs. Even at that, some libraries in rural areas can spend only a faction of the $4. –More books and other content, available through a national digital collection even though local libraries could still purchase their own books. One result? Rich collections of ebooks and multimedia items for older Americans and others with mobility issues. –User access not only to public- and K-12 specific catalogs but also to a universal catalog that will encompass the academic system as well. Public and school libraries will be smartened up, not dumbed down. Their catalogs will be able to include more academic works and source materials of interest to their particular sets of users. –Easy customization capabilities to allow for localization that highlights content of great interest. –Ongoing experimentation with different business models, including more development and use of open source material of mass appeal. –National-level outreach and marketing to point TV watchers and others to local libraries in a highly targeted way. The Hernandez scenario tells of a public service spot that is far from generic. Instead of vaguely talking up local libraries, the spot encourages a watcher of a vampire show to go to the library and check out a vampire book and meet like-minded people. Needless to say, via matching grants, the endowment could also finance local outreach. It could pay for display of such spots, national and local, if alternatives were not available. –The distribution of promotional text and videos via social media services. Many of the promotions could point to specific library offerings related to a user’s interests, including topics of Facebook-style groups. –Improved SEO services—for both public and academic libraries—to improve the online visibility of library content and services. Here is an example of the possibilities. —Ebook literacy. Users of both public and academic libraries tend to be using suboptimal devices for their personal needs. Endowment-supported programs will can educate librarians and users and, in some cases, pay for appropriate devices. –Family literacy programs offering both ebooks and paper books. The endowment will encourage partnerships between public libraries and organizations such as childcare facilities, not just to distribute books as loaners but also as gifts, especially for young parents and their children. —Cell phone book clubs with social events intended especially to reach younger people. The name is aspirational. Participants will be able to read books however they want, including on paper, not just on tablets or E Ink readers with larger screens. But cell phone reading is the choice of millions of younger Americans, especially members of minorities. Phones are among the most ubiquitous of gadgets, carried everywhere, like keys, wallets or purses. Furthermore, future cell phone designs may include screens that can fold out to display more words on the same page. –Funding for the education, hiring, and professional development of digitally savvy librarians for the poorer districts, especially those from low-income and minority families. Worthy candidates for such programs could be identified as early as high school. –Money for 3D printers, ebook readers and other new technology. One goal of public libraries should be to interest younger people desiring blue-collar careers to acquire technical skills of interest to employers. Both nationally and locally , public and school libraries should work with prospective employers. —A national digital reference service for the U.S. Many public library users may know in a general way what they need but not know the precise questions to ask. The reference will develop databases with a “wizard” approach to help narrow queries. In addition, users will enjoy access 24/7 to a wide variety of subject specialists. A variant of the service will also serve many users of academic libraries. The public and academic systems will jointly operate the service. —USBook (with US pronounced as “us” rather than as initials), a social media service designed for long-term storage of family memories and for family use. It will not replace services like Facebook. Rather, ideally, through agreements with Facebook and similar companies, it will serve as a repository for content originated there. It may also appeal to users who want a family-friendly environment without constant barrages of ads and of news from unknown sources. –Cooperation with the academic system in access to cultural and historical source material. This is a “must.” At the same time, such a need by itself should not mean that public and academic libraries should be together in “one big tent.” They can work together on multiple sideshows. The percentage of money that universities spend on libraries has plummeted, and the efficiencies of the Internet are one reason. Most likely the percentage will never reach the old level. But there is no doubt that we should be spending more on academic libraries in a cost-effective, Internet-wise way while preserving physical libraries. The endowment could help academic and research libraries maximize efficiencies and reduce unnecessary redundancies. 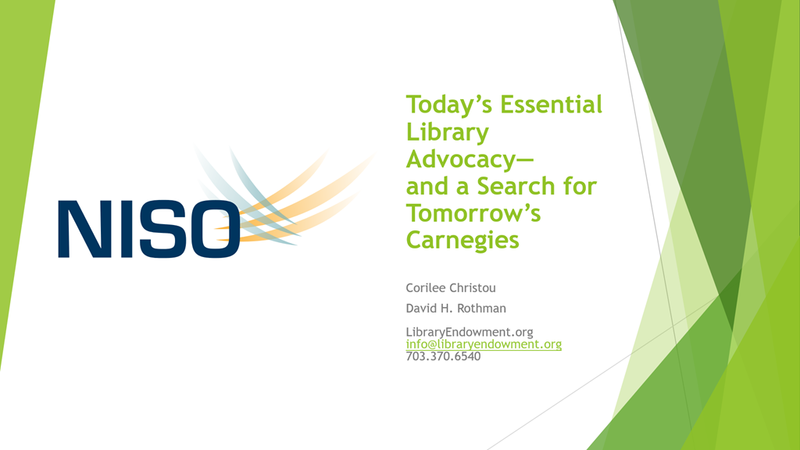 –Board members passionate about the specific needs of academic libraries, even though they will share resources with public and K-12 libraries. –More content and shorter waits for users seeking popular books and other items. Public library users will enjoy a similar advantage. –More content and other resources for students at small institutions, including those with special talents who today cannot easily find what they need locally. Significant differences exist between library spending at large and at small colleges and universities, and the number of students is not the only factor. –Better resource sharing of collections. Many books in academic systems, especially ebooks, are never checked out. A national collection will make it easier to publish highly arcane titles and for them to find readers. It also will facilitate interlibrary loans of content owned by specific libraries. 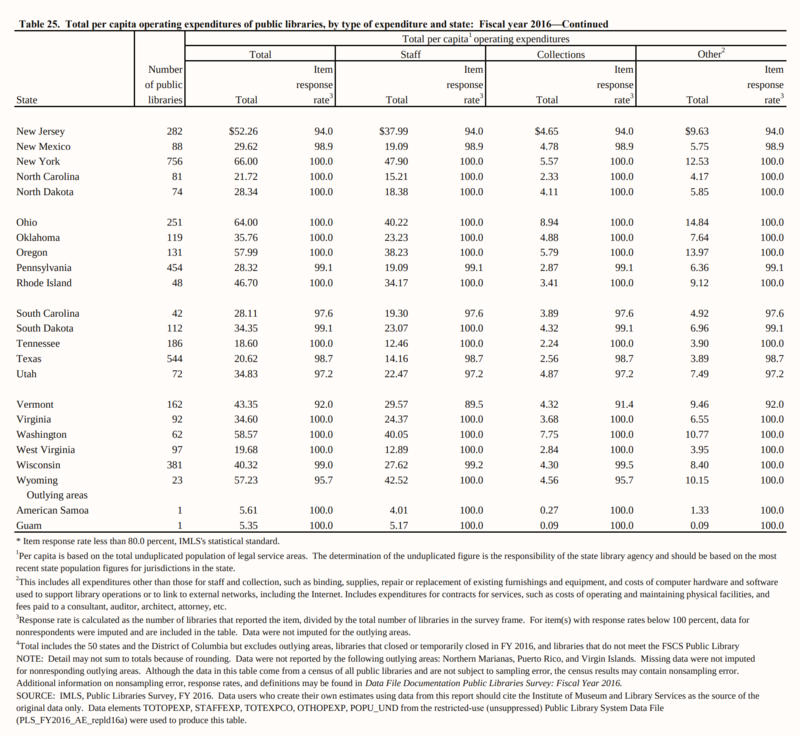 –More leverage with publishers of serials, the prices of which have increased dramatically in recent years (causing colleges and universities to drop subscriptions at the expense of learning and research). 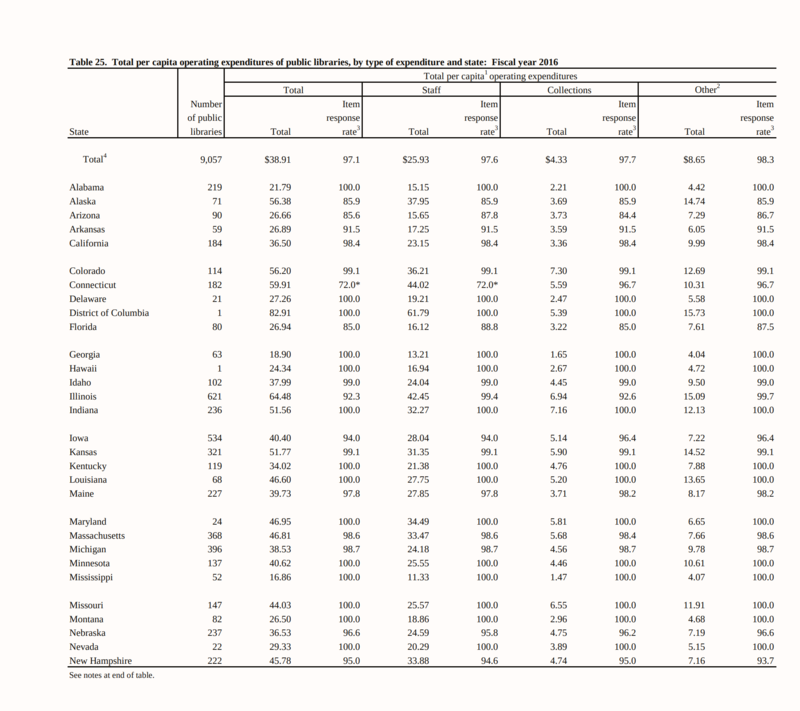 Seventy percent of the materials budgets of surveyed academic libraries go for serials, the prices of which have sharply increased Might this percentage be too high, especially with so many competing needs? At the same time academic journal publishers that add value will actually enjoy more opportunities. The market will be bigger, with more money available, by way of the endowment. –Access to the public system as well as the universal catalog, so students and faculty members can still enjoy access to popular fare such as bestsellers. –More intellectual freedom. Significant differences can exist between the academic community and the rest of the country on many issues. An endowment with a two-system approach will reduce the chances of local jurisdictions pressuring the academic side. –More use of open source, with resources available for libraries and parent institutions not just to commission such works but also to buy properties from publishers for open source use. –Development of both general and highly specialized courses, matching disciplines, to enable students at all levels to conduct more comprehensive search and identify the very best sources. The sources can mix human instruction with instructional video and software. Currently, many university faculty members overestimate the information literacy levels of students. —Ebook literacy with special academic needs in mind. –Preservation of cultural and historical documents, which can be conducted in partnership with public libraries and museums as well as the Hathi Trust and the Internet Archive, among other organizations. This can build on the existing activities of the Digital Public Library of America, which, as noted, could be the start of the academic system. The preservation should include both paper and born-digital documents. –Truly permanent links, accessible from both library systems and the open Web. Networked books and other link-reliant items will never reach their full potential if links come and on. Concepts such as Digital Object Identifiers are helpful. But a library endowment approach will offer the ultimate in technical and financial stability. The public as well as the academic side could benefit. –Access to other national digital libraries adhering to the same standards of permanence and offering sufficient openness. In time there might be a world search engine or catalog encompassing the holdings of all national digital libraries meeting standards. However, except possibly for backup purposes, we should avoid a global database for now. Too many cultural and political clashes will be at work for it to succeed. –Development of related infrastructure offering redundant storage, with precautions against hackers deleting or changing content. The public system could share this infrastructure. –Possible sharing of powerful computing resources linked closely with databases. –More content of high-level scientific interest than the current DPA offers. –Sophisticated databases to match up graduates and employers and make clear the long-term needs of both industries and individual employers.